Another day in paradise today...we started at the respectable hour of 9am and after a breakfast of bread and bubbergonash, yogurt and fruit we headed south from the capital of Oman. After traversing the towering mountains surrounding Muscat we entered the flat coastal desert plains. For hours it was nothing but sand and goats on the right and rich blue and teal ocean to the left. Our first stop was the sink hole that you can c in the pic below. Stunning cool water for a swim and the fish had a field day eating all the dead skin off Narelle's runners feet (it's true). Then we were off to a wallai (like a river wash) for a hike and a picnic lunch. This wallai had water in it after the recent rains. As u can c we joined in with the locals and had a wonderful time. I am not sure where they learnt about westerners diets but this was the lunch that our guide arranged for us. 4 meat and salad rolls (think subway), 2 chicken and chips containers, 2 containers of salad, four drinks, two bananas, two apples, and a two cakes. Jesus, I mean Alla, I thought he was going to leave us in that canyon for a month. Heard our first Americans today, then saw them 5 minutes later (sorry Jen, Andy, Kirsten, Ida). Top right pic: a normal looking town on the highway. 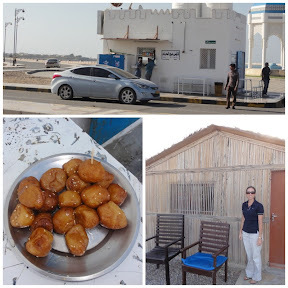 Drive through tea and donuts Oman style for afternoon tea. One honk means tea, two honks tea and donuts...leaning on the horn means hurry the F up stupid tea boy. Bottom right, our hut for the night. The kids were having a fantastic time with this blow up tube. Refreshing to c kids playing with simple things. 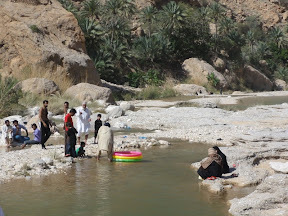 Three Omani woman enjoying a sunny day at the river with their families. Off to c the turtles tonight before retiring to listen to the waves of the Oman Gulf just a few metres from our hut. Jane, Mons we will urgently need warnings of a tsunami, actually just a slightly higher than expected high tide will c us submerged, I told Narelle she should sleep with a life jacket on. Issue with posting comments is now fixed. 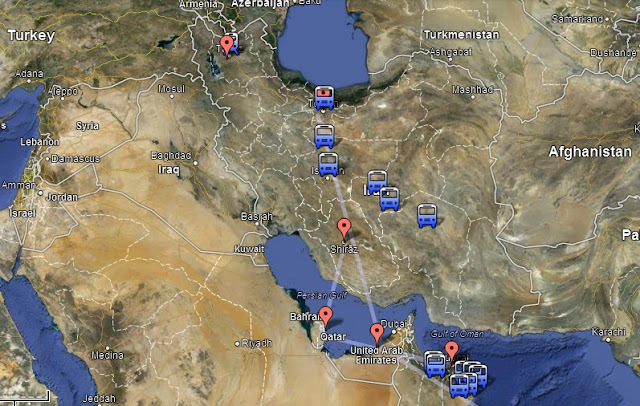 Where are we going this time...?